Decarbonisation keeps climate change in check and contributes to cleaner air and water. Countries can price CO2-emissions to decarbonise their economies and steer them along a carbon-neutral growth path. Are countries using this tool to its full potential? 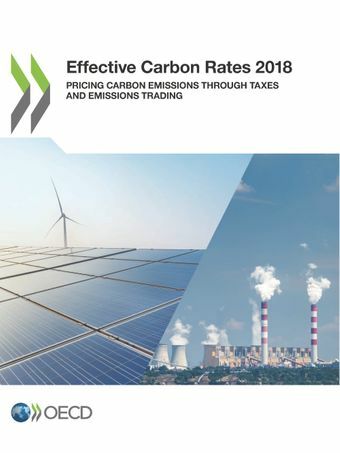 This report measures carbon pricing of CO2-emissions from energy use in 42 OECD and G20 countries, covering 80% of world emissions. The analysis takes a comprehensive view of carbon prices, including specific taxes on energy use, carbon taxes and tradable emission permit prices. The ‘carbon pricing gap’ measures how much the 42 countries, together as well as individually, fall short of pricing emissions in line with levels needed for decarbonisation. On aggregate, the ‘carbon pricing gap’ indicates how advanced the 42 countries are with the implementation of market-based tools to decarbonise their economies. At the country level, the gap can be seen as an indicator of long-run competitiveness. Measuring the momentum Decarbonisation keeps climate change in check and contributes to cleaner air and water. Carbon pricing is a cost-effective means of reducing CO2 emissions, but countries are still not using this tool to its full potential to curb climate change.Experts from the OECD Centre for Tax Policy and Administration presented the key findings from their report on Effective Carbon Rates, which measures pricing of CO2-emissions from energy use in 42 OECD and G20 countries, covering 80% of world emissions, and provided a first appreciation of countries’ progress since 2012.